Harvard has had the pleasure to partner with the French Cultural Center numerous times over the last 70 years. An iconic Bostonian institution, the Center is located in historic Back Bay, at the corner of Berkeley and Marlborough, a few steps away from the lovely Public Garden. The French Cultural Center was founded in 1945 in answer to Général de Gaulle’s call on all nations to support France in the difficult times of German occupation. In 1949, Mrs. Edna Doriot and her husband, Général Georges Doriot, took the helm of the institution. Général Doriot was a pioneer venture capitalist and a legendary Professor at Harvard Business School, and it was through this opportunity that Harvard became deeply involved in the Center’s development. The French Cultural Center has evolved into a comprehensive community hub with a multitude of events, a rich library, and the best French classes available in the city. Since then, the French Cultural Center has evolved into a comprehensive community hub with a multitude of events, a rich library, and the best French classes available in the city, and Harvard is still involved with the Center to this day. In 2016 and 2017, Harvard partnered with the Center on several activities. Many professors were experts on discussion panels, including Vincent Pons from Harvard Business School who led a talk regarding the French and American elections alongside Ted Widmer, former speech writer of both President Bill Clinton and Secretary of State Hillary Clinton, Muriel Rouyer of Harvard Kennedy School, as well as Art Goldhammer, chair at the Center for European Studies at Harvard University. 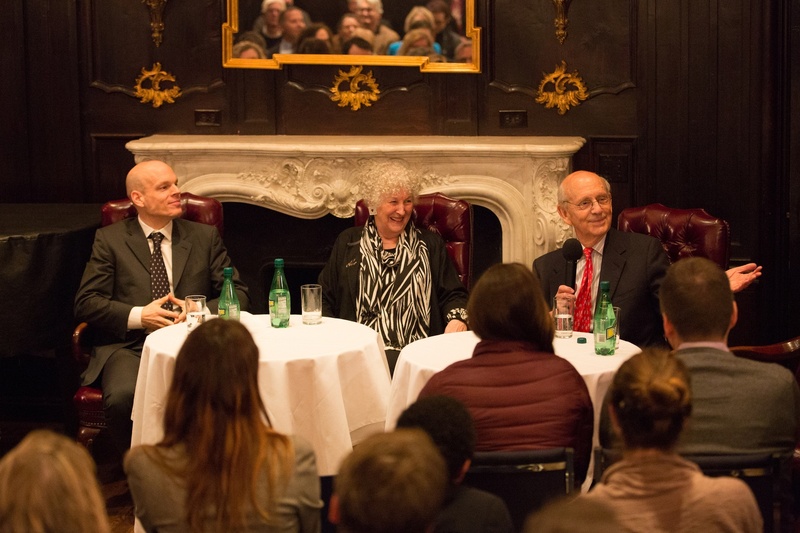 Holger Spamann of Harvard Law School took part in a discussion held at the Center, moderating a debate with Associate Justice of the Supreme Court Stephen Breyer, and renowned French courtroom sketch artist Noëlle Herrenschmidt. The Harvard Widener Library was involved in the co-presentation of an exhibition of artwork relating to the Charlie Hebdo attacks in France.This art show was curated by the Romance Language department of Harvard University, Lidia Uziel from the Widener Library, and Harvard professor Nicole Mills. Later in the year, Virginie Greene of Harvard University alongside peers from MIT and Paris-Sorbonne held another discussion covering the involvement of the United States during World War I and the birth of humanitarianism as we know it. At the end of September, Professor Doris Sommer from Harvard University will moderate a heartfelt panel discussion between artists and residents of a women’s shelter. It is culturally eye-opening and academically driven events such as these that have inspired Harvard to get more and more involved with the French Cultural Center over the years. The Center created a membership tailored to the needs of students, and we invite you to attend their Open House, happening on September 14. You will get to discover their breathtaking Back Bay mansion, sample the Center’s classes, including their famous French cooking classes, and hear first hand about their calendar of upcoming events, which features wine tastings, panels, concerts, and fashion series. It is just like studying abroad, only two miles from Campus!